Before you install and configure Windows PowerShell Web Access, we recommend that you read both this topic and Use the Web-based Windows PowerShell Console, which describes how users sign in to the web-based console, and some of the limitations and differences in the console. End users of the web-based console should read Use the Web-based Windows PowerShell Console, but do not need to read this topic. Using PowerShell it is easily to retrieve a nice overview of disk size (GB) and free disk space (GB) from multiple servers. With such a script it is possible to analyze trends in disk usage over a specified period. Create a directory (for example “C:\Log”) with a file called “Servers.txt” in it. List all servers within the text file where you want to retrieve the disk usage from. 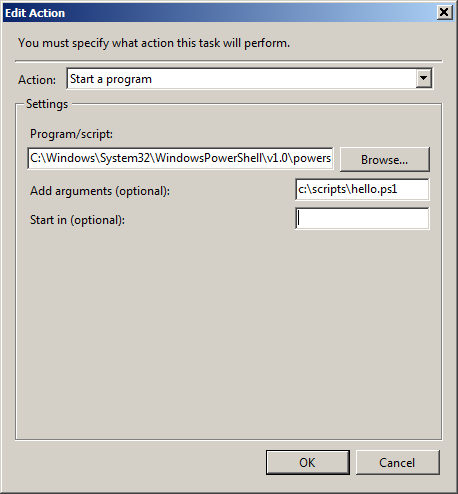 Start PowerShell and run the PowerShell command as specified below. You will get an overview of disk usage from all listed servers. From this grid you can cut and paste all the information into a spreadsheet to make alternate calculations and graphs. How do you find out when was the last time a particular user logged on? (Get-QADUser username).lastLogon looks like an obvious answer but there are a few gotchas to be aware of. The main of them: lastLogon attribute is actually not replicated between domain controllers so if you have more than one DC (which I am sure you do) you need to get it from all of them and get the latest of them. You should also keep in mind that if your users do not log off and simply lock their workstations they do not log on either – Kuma is describing here how he has a script logging off users every night to avoid this. Another alternative is using lastLogonTimeStamp attribute instead. This one does indeed get replicated. It was introduced in Windows 2003 (make sure your schema is 2003-level or later). But keep in mind that this one is not real-time as it is only replicated every 9-14 days. The problem is that PowerShell syntax can obviously have elements that .bat files cannot stand, and that you cannot pass multiline script as powershell.exe parameter. As Bruce points here PowerShell has the -EncodedCommand parameter, which lets you pass any PowerShell code as base-64-encoded string. Remove all the comments ( everything that starts with #). Put ; at the end of each line. Supply the string you get as the -command parameter for powershell.exe. You can find powershell.exe in your system32\WindowsPowerShell\v1.0 folder. If you want to also get your exit code from the script, you would need to re-transmit that by adding exit $LASTEXITCODE to the command. E.g.